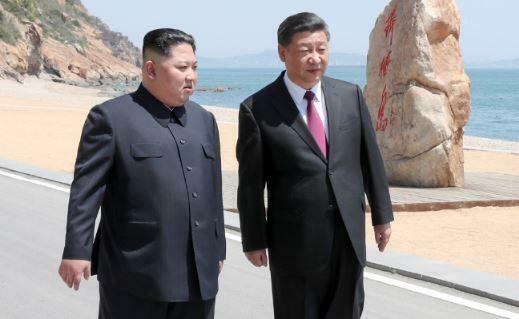 China said on Tuesday that President Xi Jinping had met with North Korean leader Kim Jong Un in a northern Chinese port city. The unannounced meeting, held Monday and Tuesday in Dalian, was the second between the two men in recent weeks, following Kim's March visit to Beijing, his first since taking power six years ago. China is North Korea's only major ally, although trade between them has plummeted in recent months as Beijing enforces United Nations economic sanctions in response to the North's nuclear bomb and ballistic missile tests. The meeting between Xi and Kim comes as the North Korean leader prepares to hold a historic summit with U.S. President Donald Trump. Shortly after Kim's visit to China was announced, Mr. Trump tweeted that he would have a phone conversation with his "good friend" Xi later on Tuesday. "Relationships and trust are building," Mr. Trump said. Kim willing to accept Trump's "denuclearization" demand? Kim visited Beijing on March 27, but this time the leaders met in Dalian, which CBS News correspondent Ben Tracy notes is much closer to North Korea and thus easier for Kim to reach. The North Korea leader prefers to travel by train. Late last month, Kim stepped across the Demilitarized Zone into South Korea for a historic summit with President Moon Jae-in. It was the first time a North Korean leader has crossed over to the southern side of the Demilitarized Zone since the Korean War armistice in 1953. The two Koreas agreed during the historic summit to rid their peninsula of nuclear weapons, but they failed to provide any new specific measures on how to achieve that goal. A joint statement issued after the leaders' talks Friday said the two Koreas had confirmed their goal of achieving "a nuclear-free Korean Peninsula through complete denuclearization." In what both sides referred to as the "Panmunjom Declaration," the Koreas agreed to an end goal of formally ending the Korean War with a peace treaty by the end of this year, and to immediately end all hostilities on the Korean Peninsula, involving trilateral or 4-way talks with the U.S. and China. Kim and Moon in their talks vowed to have more meetings, with Kim joking that he would make sure not to interrupt Moon's sleep anymore -- a reference to the North's drumbeat of early morning missile tests last year.